family reunion | Mother of the Year... AGAIN! With everyone getting older, more busy, and started lives of their own with their kids, family reunions are very difficult to plan. Everyone always has something. But with this past weekend almost everyone passed on their normally scheduled activities and we all met in Natick at Tom and Mo’s house. We had a blast… just time to chill. Not time to wait for Santa, plan around a meal or listen to vows. It was time to just hang out and talk about normal stuff. When you see your extended family those conversations are few and far between. The day was great, their house was great, the attendance was great and the conversations and company made it a day to remember. I often am the one with the camera and without the conversation, today I spent a little time with the camera and a lot in conversation. Good stuff. Where does the time go? It has been such a whirlwind summer with so many exciting things and I decided to take the time to enjoy them and have not taken the time to write about them. Don’t get any ideas because I’m not doing it now – okay, maybe a little snippet because this one is still piping hot. After having lived in California for so long, having missed so many family functions – the happy ones anyway – (yes, the same ones that you complain about having to attend BUT in hindsight you completely appreciate that you had the chance to go) it occurred to me that time is precious and there is not time like right now to try to get people together. Once the first few funerals hit a family and you realize that they become your family reunions and you certainly reflect on how many gatherings over the years you didn’t make the time for that you could have. SIDE NOTE: About two years ago I tossed out a family reunion to my Dad’s side of the family and I got a luke warm reception at best. They are the Cape Codders. They all have houses one the Cape with the exception of our family. I have come to know that they end up seeing each other much more often than the NH Reilly’s get to see them. It’s happenstance – oh we met at the golf club, oh we got together for 4th of July, oh this or oh that. So, when my request to them was met with “oh, you’ll never get everyone together… hockey schedules, school, games, coaching” etc. I let it go. Last year, sadly four people on the Reilly side passed away. Two were from breast cancer, one from age and the other from a combination of things. My two cousins, Mary Jo and Susan were not much older than me. My grandmother and my Uncle were a significantly older; although age does not make death any easier it seems to make it a little more justifiable in my head. However, when you see it as an Uncle but THINK about him as a father, a friend, a grandfather, a brother you see so much more clearly how massive the impact is. That goes all the way around. I have been so sorry that I never pushed for a reunion with the Reilly’s for whomever could attend. Now it’s different because now it’s so obvious that family members are missing. It would feel so much heavier with the tragedy of last year. Flash forward to 4 months ago. I polled a few of my Mom’s side of the family. Would they like a family reunion – YES, the poll suggested they would. I contacted my cousin Stephen who is equally as motivated as I to keep family by our side. He thought it was a great idea (he had attempted a few years back and got a luke warm response) – no sooner had we talked about it he had secured a location; pretty much one of the most desirable locations possible. It would be at his parents home in Kennebunk with the ocean view. He was my partner in crime and it went off beautifully. The gathering was this past weekend. 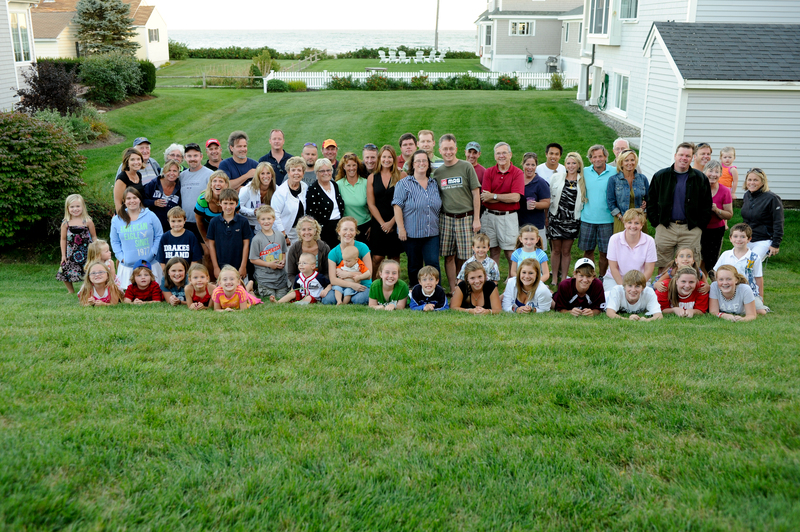 Hurricane Earl faked us out and we had a beautiful sunny day to share with more than 65 members of the Gervais family. It was a blast – hours at the beach followed by dinner and ice cream sundaes. Many new friends were made and the generation that I am raising found friends (family) they didn’t know they had. I believe you need to constantly share family. You should remind yourself often about who you are, where you came from and the things that made you who you are. The answer to who you are most likely includes some form of family. Mine certainly does. I want my kids to know their Nannie and Grandpa had brothers and sisters too and they have families too. It seems the way that life is so jam packed with expensive commercialized opportunities for the kids to get embedded in it becomes easier and easier to forget to take the time to sit back and enjoy your roots. Life becomes very linear that way. It’s all in the here and now. I hope the day shared with our children and with others how special it is that everyone there wanted to be there with each other. They wanted to catch up with one another and in some cases – specifically the little ones – meet each other. The ones who engaged with each other had a blast. I am so happy it worked out so well – for everyone. And, I am so thankful my Godparents shared their home – it made the day perfect.